, a distinguished English bishop, was born about 1662, at Slapton in Northamptonshire; and, being sent to Westminster school in 1676, was admitted on the foundation, and elected to Christ Church, in Oxford, where he of course became a student in 1680. He took the degrees in arts in 1687; after which, entering into orders, and proceeding in divinity, he took a bachelor’s degree in that faculty, June 23, 1694. The same year he was made preacher to the hon. society of Lincoln’s Inn, in which station he acquitted himself so well that he was appointed to preach Mr. Boyle’s lecture in 1697. Having finished those eight sermons, he drew them up in the form of a continued discourse, which he published the same year. The subject of this piece being a defence of religion in general against atheism, Gastrell prosecuted the design further, in asserting the truth of the Christian religion against the deists. This he published in another discourse, in 1699, by way of continuation, or second part of the same subject. He commenced D. D. July 13, 1700; being then chaplain to Robert Harley, esq. speaker of the house of commons. The ferment that had been raised by the dispute between South and Sherlock upon the Trinity, being still kept up, Dr. Gastrell, in 1702, published“Some Considerations concerning the Trinity, and the ways of managing that Controversy:” and the same year was collated to a canonry of Christ Church in Oxford. | Meanwhile, he continued to give public proofs of his hearty concern for religion; and published, in 1707, his excellent work entitled “The Christian Institutes, or the sincere Word of God, &c.” collected out of the Old and New Testament, digested under proper heads, and delivered in the words of scripture. This has been repeatedly printed. 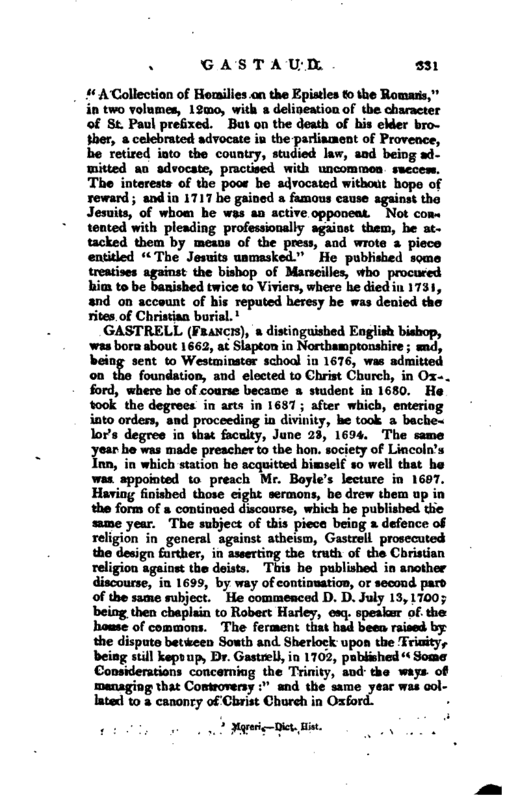 The same year also, being appointed to preach the sermon at the aniversary meeting of the charity-schools in London, he printed that discourse; in which the peculiar advantage of these charities is set in a new light, by contrasting them with the popish monasteries. 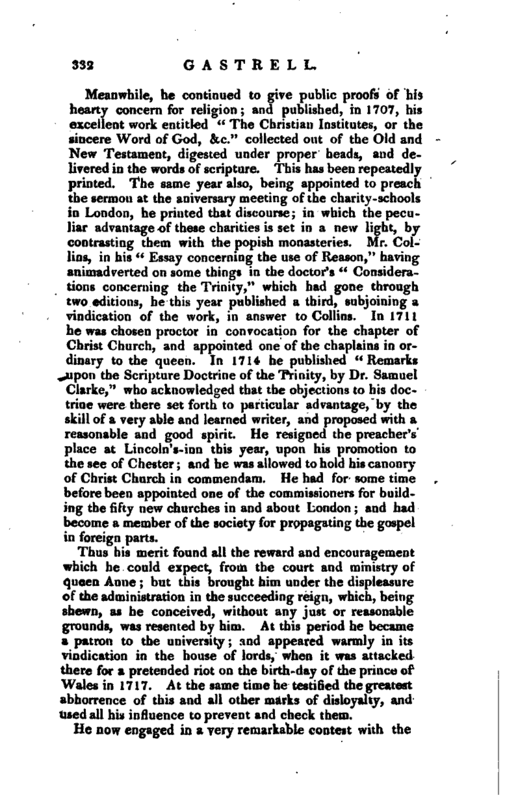 Mr. Collins, in his “Essay concerning the use of Reason,” having animadverted on some things in the doctor’s “Considerations concerning the Trinity,” which had gone through two editions, he this year published a third, subjoining a vindication of the work, in answer to Collins. In 1711 he was chosen proctor in convocation for the chapter of Christ Church, and appointed one of the chaplains in ordinary to the queen. In 1714 he published “Remarks upon the Scripture Doctrine of the Trinity, by Dr. Samuel Clarke,” who acknowledged that the objections to his doctrine were there set forth to particular advantage, by the skill of a very able and learned writer, and proposed with a reasonable and good spirit. He resigned the preacher’s place at Lincoln’s-inn this year, upon his promotion to the see of Chester; and he was allowed to hold his canonry of Christ Church in commendam. He had for some time before been appointed one of the commissioners for building the fifty new churches in and about London; and had become a member of the society for propagating the gospel in foreign parts. Thus his merit found all the reward and encouragement which he could expect, from the court and ministry of queen Anne; but this brought him under the displeasure of the administration in the succeeding reign, "which, being shewn, as he conceived, without any just or reasonable grounds, was resented by him. At this period he became a patron to the university; and appeared warmly in its vindication in the house of lords, when it was attacked there for a pretended riot on the birth-day of the prince of Wales in 1717. At the same time he testified the greatest abhorrence of this and all other marks of disloyalty, and used all his influence to prevent and check them. He now engaged in a very remarkable contest with the | archbishop of Canterbury, about the degrees granted in virtue of his metropolitical power. The occasion was this: The presentation to the place of warden of the collegiate church of Manchester in Lancashire falling to the crown, George I. nominated Mr. Samuel Peploe, vicar of Preston, in the same county. But that gentleman, being then only M, A. found himself obliged by the charter of the college, to take the degree of B. D. as a necessary qualification to hold the wardenship. To that end, having been bred at Oxford, where he had taken his former degrees, he went thither in order to obtain this; and had actually prepared the best part of his exercise for that purpose, when he was called to Lambeth, and there created B. D. by the archbishop, who thought the university ought, in respect to the royal nomination, to dispense with the usual exercise. With this title, he applied to bishop Gastrell, in whose diocese the church of Manchester lies, for institution. 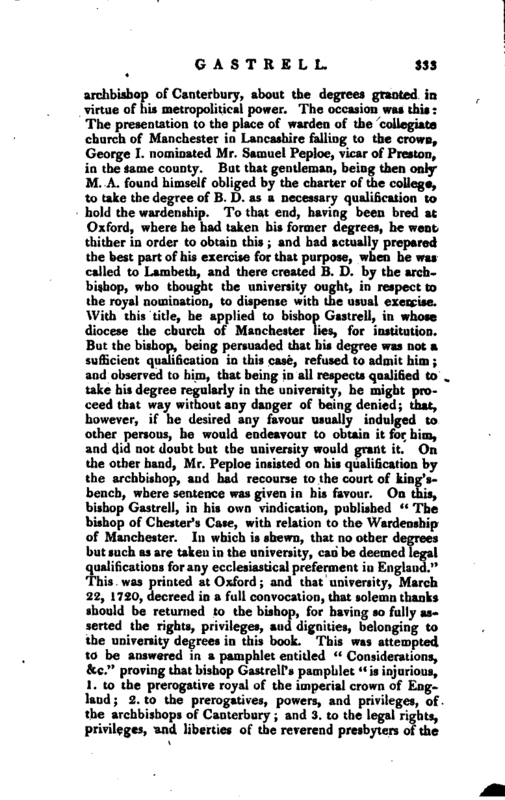 But the bishop, being persuaded that his degree was not a sufficient qualification in this case, refused to admit him; and observed to him, that being in all respects qualified to take his degree regularly in the university, he might proceed that way without any danger of being denied; that, however, if he desired any favour usually indulged to other persons, he would endeavour to obtain it for him, and did not doubt but the university would grant it. On the other hand, Mr. Peploe insisted on his qualification by the archbishop, and had recourse to the court of king’sbench, where sentence was given in his favour. On this, bishop Gastrell, in his own vindication, published “The bishop of Chester’s Case, with relation to the Wardenship of Manchester. In which is shewn, that no other degrees but such as are taken in the university, can be deemed legal qualifications for any ecclesiastical preferment in England.” This was printed at Oxford; and that university, March 22, 1720, decreed in a full convocation, that solemn thanks should be returned to the bishop, for having so fully asserted the rights, privileges, and dignities, belonging to the university degrees in this book. This was attempted to be answered in a pamphlet entitled “Considerations, &c.” proving that bishop Gastrell’s pamphlet “is injurious, 1. to the prerogative royal of the imperial crown of England; 2. to the prerogatives, powers, and privileges, of the archbishops of Canterbury; and 3. to the legal rights, privileges, and liberties of the reverend presbyters of the | church of England; wherein it is plainly proved, that ther Universities have not the sole power of granting degrees.” It is somewhat remarkable, that this Mr. Peploe succeeded him in the bishopric of Chester. 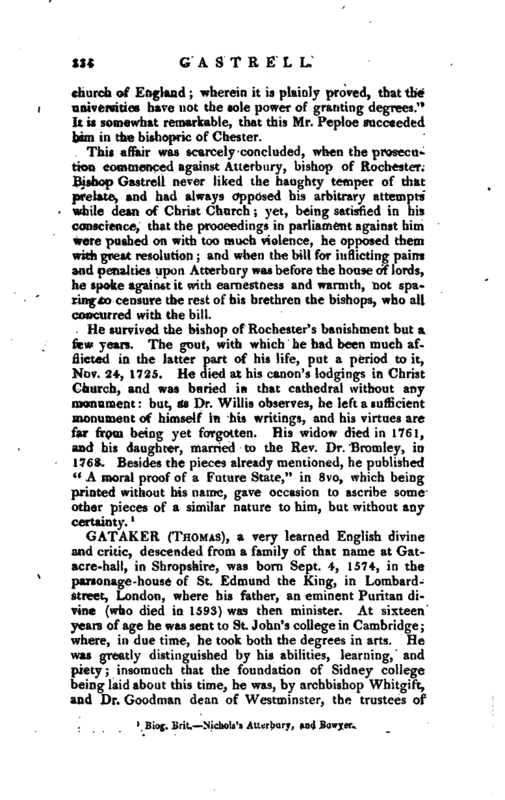 This affair was scarcely concluded, when the prosecution commenced against Atterbury, bishop of Rochester. Bishop Gastrell never liked the haughty temper of that prelate, and had always opposed his arbitrary attempts while dean of Christ Church; yet, being satisfied in his conscience, that the proceedings in parliament against him were pushed on with too much violence, he opposed them with great resolution; and when the bill for inflicting pains and penalties upon Atterbury was before the house of lords, he spoke againstit with earnestness and warmth, not sparing to censure the rest of his brethren the bishops, who all concurred with the bill. Biog. Brit. Nichol<' Utrrbary, and Bowyer.